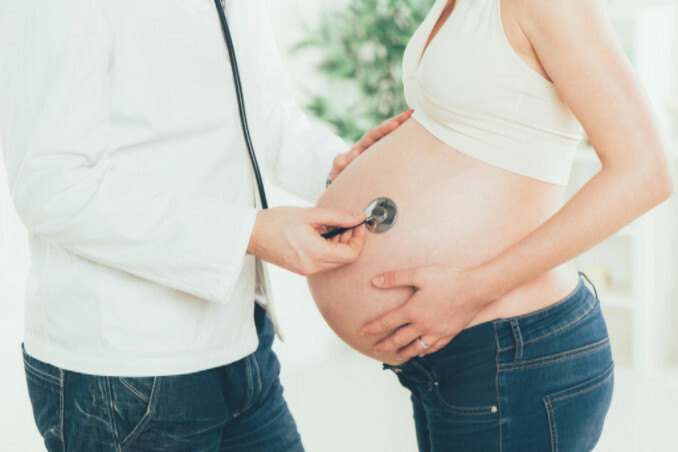 Is Pregnancy Possible After Menopause? A woman becoming pregnant after menopause is impossible. Then, why do certain women who are experiencing menopausal symptoms sometimes conceive? More often than not, misconceptions about what constitutes menopause leads to a pregnancy. Here is some information about what happens before/after menopause and when it is possible for a woman to get pregnant. When is pregnancy no longer possible? You might think menopause sets in when experiencing any symptom associated with this time in an aging woman's life. However, menopause refers to when a woman stops having menstrual periods for 12 consecutive months. After this point, a woman can no longer conceive. These symptoms appear as the body produces less estrogen. Missing a few periods does not mean that menopause has occurred, but this could be a symptom of perimenopause. A woman can become pregnant if they are not actually in menopause but in perimenopause. Women can experience symptoms of menopause for a long time while still being in perimenopause as this phase of life lasts for an average of 5-10 years. When happening naturally, the average age for menopause in the United States is 51. This means that a woman who starts experiencing symptoms around age 41 could still get pregnant for many years even when starting to miss periods. While it is possible to have a child during perimenopause, the chances of conceiving are reduced because the ovaries are producing less eggs. Since a woman can fluctuate between fertility and infertility, it is important to know when one can conceive and to prepare for this time. The majority of women in North America experience hot flashes during perimenopause, but this symptom and others might not be present for some women. Consulting with a doctor is the best way to find out if menopause has taken place, but gynecology experts do not currently have a blood or urine test that can conclusively diagnose menopause. If you are having trouble conceiving but do not have many of the symptoms of menopause, you could still be in perimenopause or menopause. However, there may be other factors that led to missed periods or other symptoms. As long as there are no other reasons, a lack of menstrual periods for a year is the best indicator of menopause even if you have no other symptoms. Pregnancy - Women who are still giving birth into their 40s and 50s can be affected by hormones, which delays menopause. Weight - Women who have a larger body mass index often experience menopause later. Since fat cells can produce estrogen, this might keep women with higher BMIs from entering perimenopause or menopause sooner. Thyroid Disorder - The thyroid regulates metabolism and could influence the reproductive system when not working properly. For example, thyroid problems can cause early or late menopause. If you experience symptoms like mood swings or hot flashes, do not be quick to assume they have anything to do with menopause if you menstruate regularly. A thyroid disorder and menopause could share similar symptoms, and you can still get pregnant if your symptoms are not related to menopause. There might not be anything wrong if it takes longer for you to enter menopause because every woman is different. To be safe, you should still consult with a doctor while aging to ensure that other factors are not stopping menopause and harming your health. If you are trying to conceive while close to the average age for menopause, you may need to see a gynecologist or fertility specialist – whether experiencing symptoms of menopause or not. Pregnancy after menopause is not possible, but pregnancy during perimenopause is definitely possible.